The ability to recognize and complete patterns is a fundamental part of mathematics. 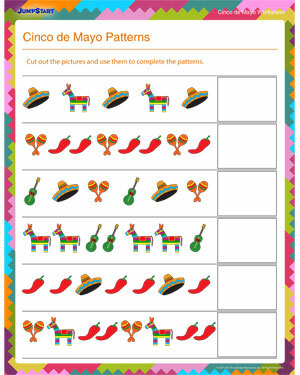 First graders can practice this important math skill in our fun Cinco de Mayo worksheets for kids! Ensure that kids are using kid-friendly scissors to cut out the answers, and ask them to stick them in the right place to complete the patterns. This math activity can be coupled with a brief discussion about the Mexican objects in the worksheet.